Cataract is considered as a condition and not a disease. Depending upon its size and location, a Cataract can interfere with the normal vision. The most common type of Cataract is age-related which develops as individuals become older. Anti-glare sunglasses, new glasses, brighter lighting, or magnifying lenses can help in countering the symptoms in the beginning. Wearing sunglasses and a hat with a brim to block ultraviolet sunlight can help delay Cataracts. Apart from age related Cataract, there are other types of Cataracts namely, Traumatic Cataract, Congenital Cataract, Secondary Cataract and Radiation Cataract. 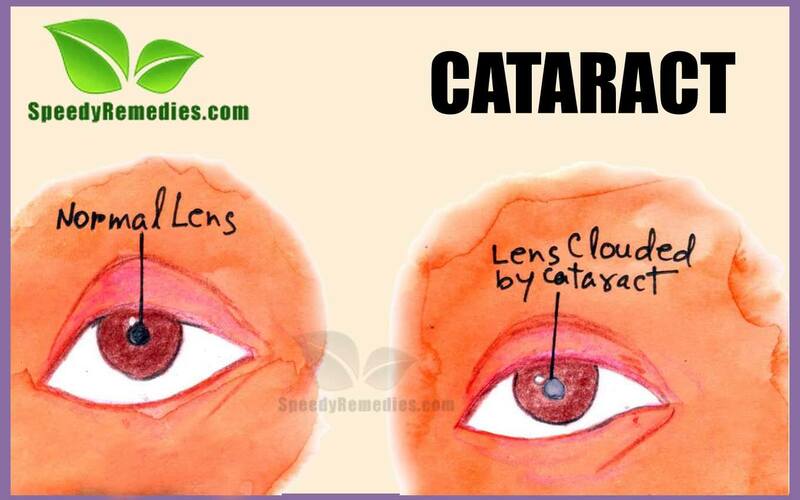 A cataract can occur in one or both the eyes. It can not spread from one eye to the other. Cataracts are made up of a protein that has altered from its natural state, distorting and eventually prohibiting required light from entering into the retina (the part of the eye that receives light). In most of the cases, Cataracts usually develop slowly and cause no problems for years. But with the passage of time, a kind of cloudiness develops on the lens and the light reaching the retina reduces. This increases the possibility of significant sight loss and even blindness. It is quite common to remove the Cataract by a simple surgery. The surgical procedure calls for the removal of the cloudy lens and replacing it with an artificial lens. Following natural home remedies for Cataract like simple eye exercises are also beneficial. This can be done by gently pressing the palms on the eyes for about 30 seconds, 4 to 5 times a day. Water and protein are the main components of the lens. Clouding of the lens occurs due to changes in these proteins and lens fibers. Secondary cataracts develop from procedures preformed to correct other vision problems such as Glaucoma. Cataracts can develop after an eye injury, sometimes years later. Such Cataracts are included under the category of Traumatic cataracts. Persons with diabetes are at higher risk for cataracts. Cataracts can develop from long term use of certain steroids as well as some lifestyle habits. Alcohol consumption and smoking habits are also associated with the early development of Cataract. Recent studies suggest that there is a correlation between low levels of antioxidants (vitamin C, vitamin E, carotenoids etc) and the formation of cataracts development. In rare cases, Cataracts can be present at birth or in early childhood due to hereditary enzyme defects. They are called Congenital Cataracts. Cataracts commonly affect distance vision and cause problems with glare. They generally don’t cause irritation or pain. They tend to cause visual changes like blurred vision, increased near sightedness, double vision in one eye, faded color vision, difficulty with glares like car headlamps and sunlight, and frequent changes in the eye’s refractive error. • Externally applying juice extracted from the flowers of pumpkin on the eyelids twice daily for about 15 minutes is a beneficial home remedy to prevent further clouding of the crystalline lens of the eye. • Putting a few drops of unprocessed pure honey in the eyes is an effective Egyptian home remedy. • Eating raw carrots or drinking fresh carrot juice twice a day is one of the most popular natural home remedies for Cataract treatment. • Grind seven almond kernels with half gram of pepper in water and consume the resultant mixture daily is yet another unbeaten home remady for Cataract. • Take a glass of warm milk and add cardamom powder in it. Drink it before bedtime. • Mix equal amounts of aniseed and coriander powder. To this, add one spoon of brown sugar. Consuming approximately 12 gram of this mixture two times everyday boosts up the healing process. • Using Eyebright herb in drops is a safe and completely natural home remedy as compared to the over the counter eye drops. • Mix one cup of rose petals and four tablespoons of raspberry leaves in four cups of boiling water. Let the ingredients rest for 30 minutes then strain and use it as eye wash. This home remedy may sound odd but the results will prove its effectiveness in due time. • In the early stages of Cataract, Dusty miller serves as a reliable home remedy by dissolving the Cataract. • Bilberry herb helps preventing the growth of cataracts. • Taking Ginkgo biloba is one the most widely used natural home remedies for Cataract prevention and cure. • Put two drops of pure castor oil (without any particles) on eyes before going to bed. • Soaked raisins, dates and figs have therapeutic properties that help in curing Cataracts. • Drinking an infusion prepared from raw parsley juice and carrot juice is beneficial in the treatment of Cataract. • Eating two or three cloves of garlic on a regular basis is considered as one of the most successful natural home remedies for Cataract. Carrots are considered a blessing in the treatment of cataracts. Spinach is a good source of carotenoid which is needed for retina and eye tissue and can help delay Cataract. Apart from spinach other vegetables like cauliflower, turnips, fenugreek, drum sticks, few nuts containing vitamin A are highly recommended for nourishing the eyes. Berries, cherries, blueberries, blackberries and several other fruits rich in vitamin C and vitamin E are also beneficial in healing this condition. Salads dressed with olive oil and lemon juice is another healthy option. One should avoid products like alcoholic beverages, puddings and pies, strong tea or coffee, sugar, white bread, cream, rice, refined cereals, pickles, boiled potatoes, condiments and sauces. Dairy products and saturated fats produce free radicals which cause cataracts and damage the lens. Hello, really this is a very interesting post about home remedies by natural ways. Everybody shouls try to follow natural remedies rather than chemical ones. I congratulate you for posting such interesting information about the cures.